Hello Everybody, Back again with another companion piece to the Nintendo Dad's RetroRewind series and this time around it is the amazing masterpiece that is Double Dragon. 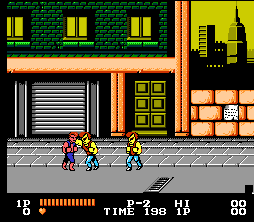 In order to prepare for what might be your favorite gaming memory you should start with the cinematic masterpiece which is the Double Dragon Movie, at least that is how I started preparing. For simplicity sake I will just embed the YouTube video right here for you, unless you want to run out and buy the VHS, DVD or Blu Ray version of it so you can add it to your permanent collection. The Double Dragon Movie is only 82 minutes long and in theory that is long enough to beat the entire Double Dragon game multiple times over. In theory the game is probably only 20-30 minutes long which is a common theme for games made in this time frame. However, in actuality the game is much longer because of amped up difficulties, multiple deaths and limited continues. With that said, when I first started this Journey I got as far as the second stage before I had to start all over from the beginning. My second and third play's went very similar and after that I decided that I wanted to beat the game so I had to become a Save State Warrior....er... Abuser. Playing this game brought back great memories from when I was a kid. 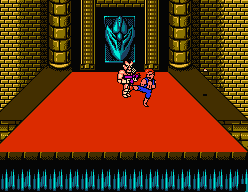 Double Dragon was one of my favorite games growing up because of the replay-ability. I loved Side Scrolling beat-em-ups and this was a game you could enjoy with buddies for hours (and never accomplish much). Ever forget how much you absolutely hated something until years later? Screw this big bald muscular destroyer of hopes and dreams. Yeah, sure, after you figure a few things out again he becomes much easier but this guy, and the Mean Green version of him caused me a lot of heart-ache both as a child and then again a month ago as an adult. Too bad the movie version was primarily comic relief, because he didn't do the game version justice. So, there I was abusing my save states, Reload-Reload-Reload-Re... oh, did I just beat that section without taking any damage? Excellent.... Oh crap, I just died and forgot to do a save state..... summabich. Slowly advancing. Saving every time a new stage loaded or reloading to see if I could get to that next part taking less damage or taking no damage when finally I get to the ending portion. For those of you who beat the game I am sure you can feel my frustration when I (re) discovered that if you die on any of the bad-guys in that last section (before the final Big Bad Reveal) that you start over at the beginning of the whole sequence of fights (which, oddly enough, includes about 300 Abobo's) instead of starting where you died. The pain in the arse was getting to him, not beating him. But, in the end, was it all worth it? I got the girl, so I guess so. 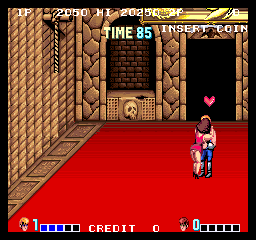 Clocking in at only 2 hours and 23 minutes I beat Double Dragon and I am happy to put it away again. I played this on the 3DS at home before bed and during my lunch breaks. It was frustrating as hell at times but it brought back a piece of my youth that I didn't know was missing. Sometime this year I plan on playing the rest of the games that were released just to see if they share the same feeling that I didn't even know I was missing with this game. I know as a child I played 2 and 3 (I think 2 introduced two player) with friends and put countless hours into them. Sadly, I'm having trouble with next month's RetroRewind because I have a new Zelda Machine that is dominating my time, all of it. It won't let me go. Hope you all enjoyed playing this as much as I did and I'm damn glad I found that horribly cheesy 80's movie to go along with it. I believe that turd of a movie actually came out in the 90's. I haven't watched it since then. I know it came out after the games but as to actual time frame I didn't care enough to look it up. However, it feels like my favorite genre which is cheesy 80's movies. But, thanks for the correction. You, however, should re-watch it. I enjoyed the crap out of it when I watched it last month. So much cheese I wanted crackers! I don't think there are enough saltines in world to cover all that cheese, lol.